I hope you've all been well and enjoying your summer. For those of you in those triple digit heat wave states.... I am sooo sorry.... that's just too darn hot. OUCH! 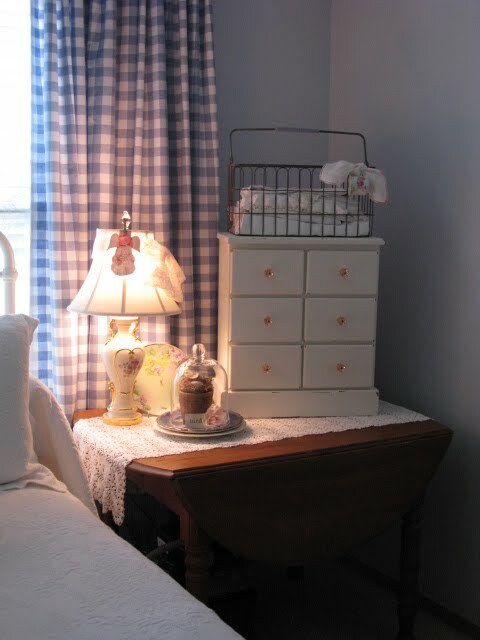 This was the room I was determined to do for under one hundred dollars and I actually did it! Everything you see in the room that is blue..... except the blue Parson's chair is new/old. 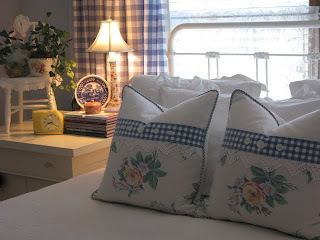 The blue check on the pillows is a bit of my Hubbs' blue checked shirt.... I LOVED that shirt, but it finally had seen it's better days... He looked so cute in it so it's a nice memory to have a bit of it in our room. The bottom part is a smidge of vintage barkcloth. The bed is not antique and is relatively new... (I think about 20 years old now).... It used to be green and I had it powder coated a lovely creamy white. I LOVE it and will have it forever. When my Hubby and I got married he had very little in the way of furniture. He had moved here from Hawaii with seven small boxes. Get ready to say Ahhhhhh... His house was pretty darn empty and he left it that way because he was looking for the right girl to make it all pretty.... here we go.... ahhhhhhhhhhhhhh. But, that table was one of the things he had. It's old and really beat up but I just love it. Do you have things like that too? Not museum quality but you really don't care? (Not that I have a single thing that IS museum quality). I've had the metal basket for years and years... it's filled with vintage linens now. There is a little cup tied onto it with a hankie... I have a blue one, but keep forgetting to change it. I bought the lamp at the Goodwill for 9.99 and then paid THIRTY dollars to have it re-wired. DANG. I had no idea it would be that much. The fellow put the little on/off do-hickey on the back and didn't align the harp so I took it all apart and did it myself. Why didn't I do that in the first place and save myself that THIRTY dollars??? The little white, vintage washstand was a gift from one of my dearest friends. 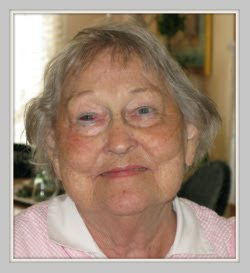 She went to be with Jesus about six years ago..... I still miss her.... And LOVE the little chest. I have many..... READ MANY tole trays... I have lots that are this shade of green so I HAD to use them. I bought this little chair at a little antique mall in Bend, Oregon last year. I didn't realize, until I got home, that one of the rungs was missing.... I took out the other one and replaced both sides. I was sooooo proud of myself. Silly me... Why didn't I take the phone out before I took the pix? CRAZY. I bought a pair of these lamps at an estate sale many years ago. I'm in LOVE with them.... so sweet, aren't they? I don't know what this old pottery is called....but I call it cottage ware. It's made in Japan and will leak like a sieve if you try to put flowers in it. Not so good. That little clock is actually PINK! :-) I just got it and am thrilled with it. Really Spencer??? TWO of these pictures?? It's late and I'm realllly tired. I just bought that round tray (not tole) over the bed at The Funky Junk Sisters sale... Isn't it cute there? I love hanging things between those windows. I have three other sets of them in the little cottage. 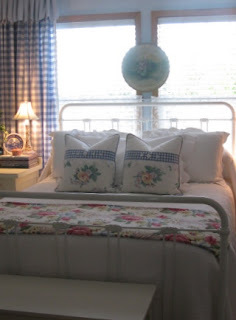 The little bench at the end of the bed is actually an old piano bench that I used to use as a coffee table. Every time my grandson came, as a little guy, I would take everything off it so he could play with his animals on it. It has sweet memories for this old grandma. I slipcovered this chair several years ago. I was thrilled that it matched in my new room so I didn't have to make another one. We have an all city garage sale every June. As I was driving down one of the back streets a gal was putting two of these chairs on the curb for free. I nearly rolled my car turning around to pick them up. FREE! Gosh I do love FREE. Trust me... it is UGLY underneath. 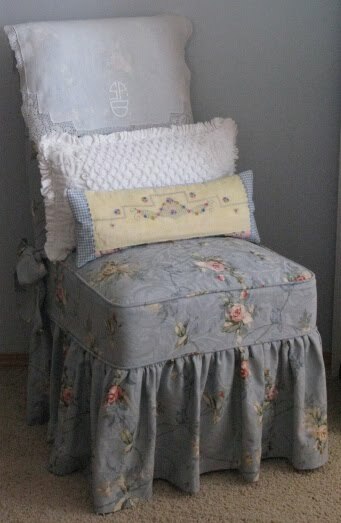 And, finally a little, girlie slip on an old chair with a pillow made from that same shirt of my hubby's and a bit of old linen. I only have that tole tray hanging on the walls.... And a huge mirror on the other side of the room... It looks really nekkid when I take wide pix, but I am really enjoying it like this for right now. I have plenty to hang, but for now.... It's going to be plain. Whew...........I made up for that week of non-blogging, didn't I? I am LONG winded today. So, there it is.... For less than $100...(not including the paint)..... and that includes the master bath.... pix to come soon. Thank you Dear Girlies....for popping by to visit and for your patience... I've been such a lousy blogger for the past few months.... 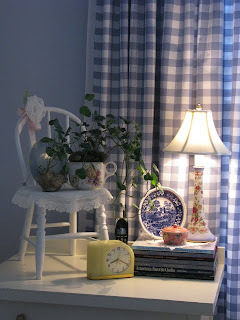 I'm finished with the den and living room too and soon to finish the kitchen here at the itsy, bitsy cottage. Why does it take so long to clean something so small? Love ya'll lots and lots. Oh....It is absolutely BEAUTIFUL!! I Love it!! My dear, sweet Spencer....you did it. You stuck with your goal, and you did it. I wish more people could see that one can REALLY stay within a reasonable budget and get the desired results!!! I just found a killer diller cute table in the trash down the street! I hauled it home and today I am going to sand it, clean it and paint it WHITE!!! You are a genius dearest.....hey, come on down and take a gander at some photos...you may have already seen my featured artist, but come down anyway! I adore it Spence! 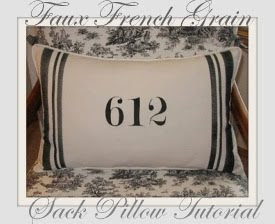 I am looking at al your gorgeous pillows and slipcovres and trying to imagine how I can do the same for my bedroom. 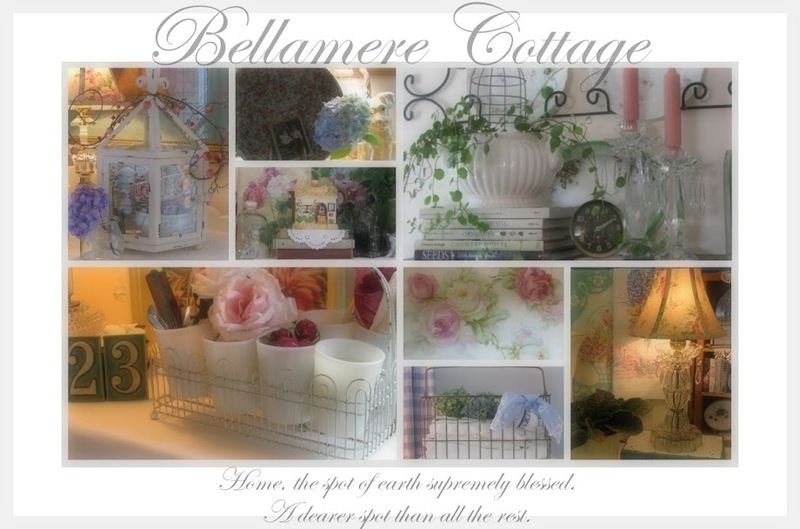 It is like a beautiful B&B, cozy, romantic, fresh. Just plain beautiful! Your bedroom makeover is so pretty. I love everything about it. I love the little chairs, they are so sweet. Oh, everything is beautiful. I would take that bed away to my house; and why not just come here and decorate my home? Love all you have done! What an awesome post and great music! I related to the goodwill, estate sale, everything...so cottage life! 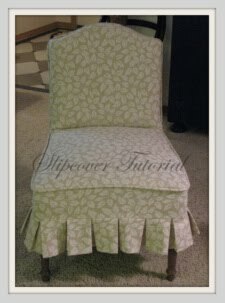 The slip covered chair, super cute! I must follow!!! You've done it! What a beautiful decorating job. I love the charm and beauty of the bedroom - full of your fabulous slipcovers, tole trays (I'm drooling) and wonderful treasures everywhere. Bravo! I really enjoyed the tour of your bedroom. You did an amazing job. I love the pillows you made, made more special by using your husband's old shirt! You are an excellent seamstress. The room looks so pulled together....very beautiful!! Thanks for sharing all of the details. The bedroom is beautiful. I love the curtains and all the sweet little pillows. Blue is my favorite color! Love it all Miss Spencie! Truly lovely and beautiful. You should be a decorator. You have the touch my friend. You do! thank you for sharing your romantic room. Oh Spencer, I haven't heard from you in soooo long, and that makes today even more special! I love this soft blue bedroom. That small white chair is just so cute on top of the chest! You did good, girl. Everything is just beautiful and for under 100 buck???? I really like the curtains and the fact that everything is coordinated but not matchy-matchy. Love it! WOOHOO!! And YIPPEE!!! Spencer your MB is absolutely charming! What a wonderful job you did on it all! I love reading about each piece, too! One of my faves is the tole tray! Great color!! I just love it all! The bed pillows are amazing and so creative! You are just so talented, and are really an inspiration to me to get on with some things here!! First is Maddy's room. We will be choosing paint this week and peeling wall paper when we get back from my sister's house. Her room will be French themed! Can't wait! Big Hugs to you sweetie! I know you are so thrilled with the beautiful outcome of all your hard work! Thanks for sharing! And have a wonderful week! It looks so comfortable and sweet. I love the room, perfect for sweet dreams! Adorable bedroom...so sweet and cozy. Makes me want to go work on my bedroom and make it more attractive. Ah the coolness of Blue. Spencer...this bedroom is SO dreamy! I love it! Well done, brilliant! Spencer...long time with no visit. What a wonderful day to stop by here. Gorgeous!!! Woo HOO! for you! 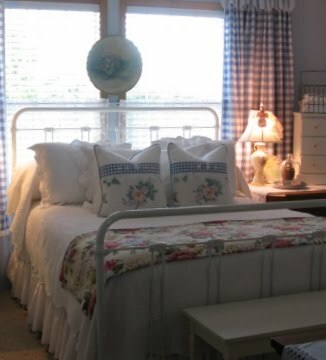 Oh goodness Spencer, your bedroom redo is wonderful! 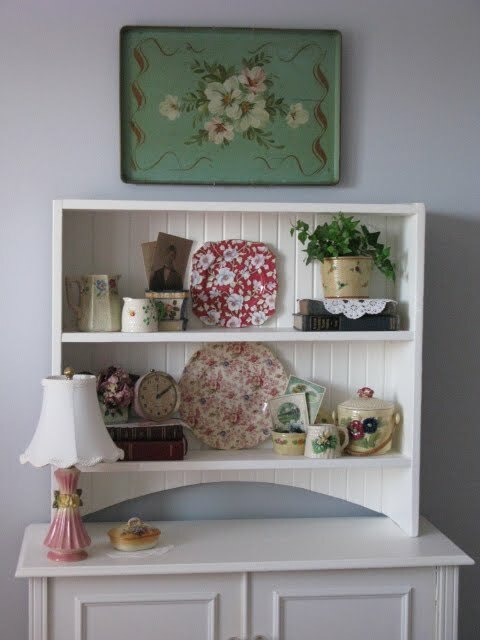 Without a doubt, your amazing sewing talents (that I am SO envious of) have really infused endless CHARM into this room! I am in love with the drapes, the darling pillows with the checked shirt trim, and the beautiful chair slips, especially the BLUE one! Every little detail is just fabulous! Now, being the visual person I am, I think you just might have unknowingly solved a dilemma for me by sharing these photos. In my new house, the only wall big enough for the bed has a low window, which means my headboard is going to block the window and light (which I was fretting and obsessing over). I see you have the same situation but I love that the openness of your headboard doesn't block much of the window. So now I see I need to start scouting for a similar headboard. Just in case I find the right headboard in the wrong color my question is: what type of business powder coated your headboard? eeeekkk, its gorgeous..looks sooo peacefull, ok I am tired!!! LOVE it all. Oh Spencer, it's breath-taking. It looks like it came right out of Traditional Home or Country Living. 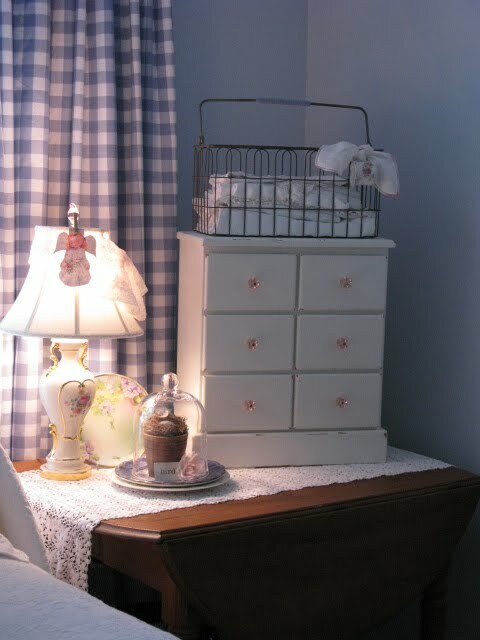 You have put together such a beautiful room, inviting and sweet and marvelous! I know you put a lot of work into it and it shows because it is gorgeous! Nice job, Spencer! I love the drapes you made. My favorite thing about this room redo is that you have a memory for just about everything ~ and that's what makes it not only a tremendous success, but a beautiful room to be in! Beautiful.... I love the colors and romantic style... thanks for participating in our "Show Off Your Cottage Monday" and letting us into your home. Well, Spencer. That is one of the sweetest bedrooms I have seen. I love blue, so there is so much I liked, I can't mention it all. The pillows on your bed...love em. Your drapes and all your special furniture make it so cozy. I a having a giveaway over on my blog. I love it! I have an antique iron bed in storage. I've been thinking of redoing my guest room. Great inspiration from you. love how you've combined everything, the matched and the mismatched. Love the colors and the use of the collectibles! I am loving this room!! You left no details undone in this sweet space!! Your lamps are just fabulous and I love the little chair vignette too!! Great job and I wonder if you sit in that room for hours just soaking in that room. I love doing that after I have accomplished something like this- actually I can do it after washing the floor but that is because I do it so seldom!!! Hi your room looks so beautiful and cozy, love the pillows on the bed and the little chair! Hello Spencer; OH your bedroom is so beautiful,, you should be so proud of your self,,,, great great job.... and for under 100 wow..... so cozy and comfy..... enjoy it all..... have a great week. Oh, my goodness, Spencer! What an awesome room ... everything blends so beautifully, is so elegant & feminine ... can we have a tea party in there? It is that inviting ... chuckle! Sweet friend, you are a CLASS ACT DECORATOR! This is just gorgeous! I love all the blues and whites...everything looks to fresh and inviting! Thanks so much for sharing, this is inspirational! What a charming room, Spencer! So cozy, and I love the mix of patterns and textures, and all your wonderful goodies to give it personality! Good morning sweet girl! Your visits always make me smile and feel sooooo good! I think I have pink eye, or some kind of strange eye thing...I need to go to the doctor today for sure! I missed your comment yesterday, but now I am catching up....ISN'T THAT LITTLE WHITE COTTAGE A DREAM? I am trying to make my bedroom like this!!! But I have to say dear one, that you have impressed me so much with your sticking within your budget. Isn't the thrill of the hunt the funnest part??? ?But of course, putting it all together is a thrill as well! A terrific room. Those pillows on the bed are my favorite...or wait! Maybe it's the blue covered chair....I can't decide. Spencer! It is absolutely ADORABLE! You outdid yourself with this makeover. Where do I start? Curtain love! Pillow love! Slip love! Decor love! 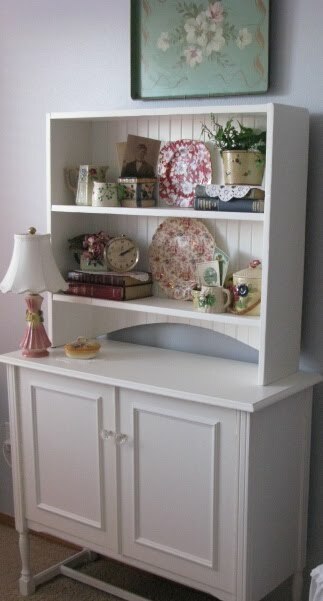 And I love the fact that you have things you love in your room... your husband's shirt, your friend's table, your grandson's favorite bench for play, your husband's chest (well, his wooden one AND his other one), etc. You did a fabulous job, and it is as cute as can be. But I knew it would be. 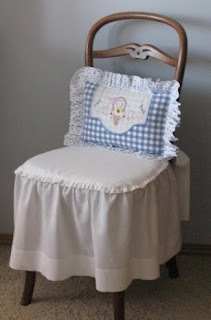 Love every single thing you did, and I'm SO impressed that you fixed the spindles in that cuter than cute little chair. GREAT JOB! I love it! It so nice that you were able to use your husband's shirt in the pillows! I love that idea! Every single detail is beautiful! Spencer, WOW WOW WOW!! Beautiful, stunning, adorable, warm, cozy.....I just don't have enough words. Love, love, love the room. I just adore your beautiful bedroom re-do!! Everything is done perfectly and on a budget, WooHoo for you!!!! 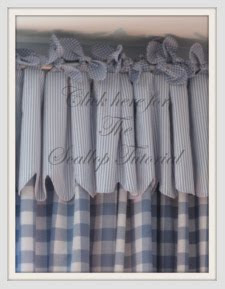 You are a very talented seemstress too, the pillows and drapes look fabulous! I really think you did an amazing job here, kudos to you!!! Spencer, I thought I was already following you, but I wasn't! OH MY!! I am now!! I have added you to my Blog List too! Your bedroom turned out absolutely beautiful. 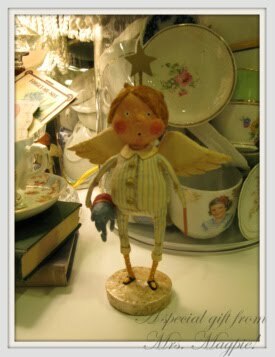 Love all the hand-sewn touches everywhere...You, my friend, are very talented. Have a wonderful day. 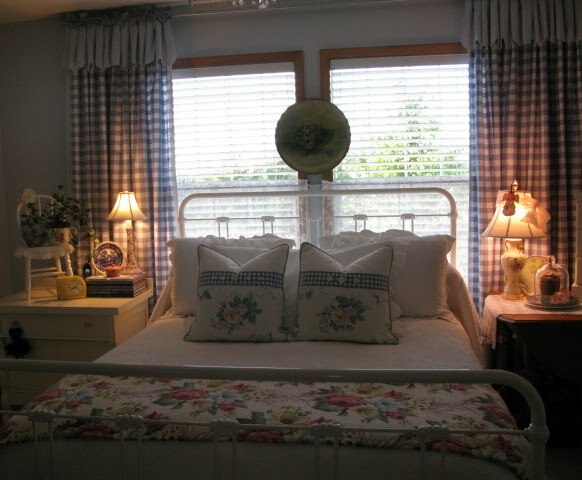 Thanks very much for sharing with us your special room at your cottage. I adore it! And it is very Special; Yes, Indeed! You have many things I also adore too for myself! We are collectors, aren't we as time shows over and over! I a had a fun visit and enjoyed myself. Thanks for your generous tour! Adore your bedroom...so sweet and cozy! Now that yellow clock of yours is really calling my name..LOVE IT! Spencer, your room turned out so beautiful!!!! I love it, the little chest, the chair and the pink clock!! 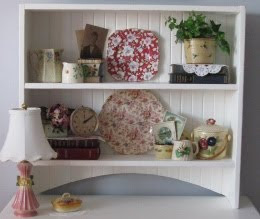 Love the chintz dishes!!! Your cushion you made are gorgeous, well done! You can come and do my room anytime!!! I love this bedroom! I especially love the curtains and those gorgeous pillows. Happy Blue Monday, Spencer! 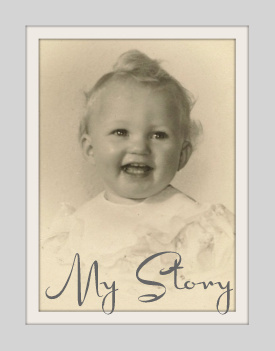 Check out my book giveaway. Spencer, this is so pretty...can you come to Iowa and help me finish mine? It's half done!! I need to get on the ball and finish it up before we start to work again in FEbruary! I particularly loved the pillows...awesome!! Hi, I'm Linda from Nothin But Country Living. I am a new follower of your wonderful blog. I love the bedroom makeover...you did a fabulous job and did not cost an arm and a leg. 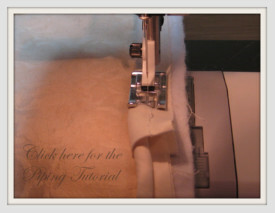 Love all your sewing projects and your attention to detail. I am the same way. I love it. I would love to be able to show off my rooms like that even though they are not as pretty as yours. I know you really don't need another comment on how pretty this room is, but it doesn't hurt either, does it? I love this room and especially the way you have styled the night tables. 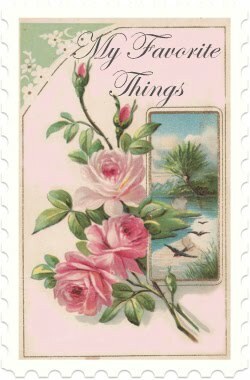 Everything is so charming. I do think the hardest thing about blogging is getting the pictures you want of interiors--tricky. You did a great job.